The Arcooda 8 Player Metro Fish Cabinet is 58" steel gaming cabinet, prewired for all Arcooda, IGS, and other game board for plug and player operation. Taiwan joysticks and buttons, stereo sound with subwoofer, bill acceptor & printer reader. <b>Supports Amusement and Gaming</b> The Arcooda 8 Player Metro fish machine can be modified to suit a wide range of configuration options for both amusement and gaming venues. These configurations allow operators to choose the options that best suit their location for a more profound impact on their business. We offer key in / key out, coin in / hopper out, coin in / ticket out, bill acceptor / thermal printer, PlayPortal cashless card system and more. <b>Supports All Fish Gameboards</b> Arcooda 8 Player Fish Machine can accept a wide range of fish hunting and video redemption-style game boards, supporting all IGS and non-IGS games such as Ocean King series, King of Treasures series, Seafood Paradise series, Santa Treasure, and Mystic Dragon. We also offer custom software options for operators looking for a specialised and distinctive product in their venue. <b>Interchangable Doors and Control Panels</b> The cabinet has been specially designed to ensure the machine can be easily updated for future games and configurations. All Arcooda 8 Player Metro Fish Machines come with pre-cut panels for bill acceptors and thermal printers. This means operators can upgrade their machine with new parts without the need for extensive modification, wiring or technical expertise. <b>Easily Upgradable to New Game Systems</b> The Arcooda 8 Player Fish Machine is compatible with an extensive selection of video redemption games. The cabinet has been created to ensure it can be easily modified to suit new games. All internal components have a modular design and changing a game is as simple and disconnecting the old game and connecting the new game. Talk with our team on compatibility options. The Arcooda 8 Player Metro Fish machine has advanced wiring suitable for all fish games on the market and comes complete with illuminated joysticks and buttons featuring LED technology. The Arcooda 8 Player Metro fish machine can be modified to suit a wide range of configuration options for both amusement and gaming venues. These configurations allow operators to choose the options that best suit their location for a more profound impact on their business. We offer key in / key out, coin in / hopper out, coin in / ticket out, bill acceptor / thermal printer, PlayPortal cashless card system and more. 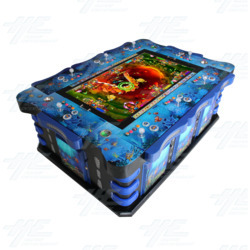 Arcooda 8 Player Fish Machine can accept a wide range of fish hunting and video redemption-style game boards, supporting all IGS and non-IGS games such as Ocean King series, King of Treasures series, Seafood Paradise series, Santa Treasure, and Mystic Dragon. We also offer custom software options for operators looking for a specialised and distinctive product in their venue. The cabinet has been specially designed to ensure the machine can be easily updated for future games and configurations. All Arcooda 8 Player Metro Fish Machines come with pre-cut panels for bill acceptors and thermal printers. This means operators can upgrade their machine with new parts without the need for extensive modification, wiring or technical expertise. The Arcooda 8 Player Fish Machine is compatible with an extensive selection of video redemption games. The cabinet has been created to ensure it can be easily modified to suit new games. All internal components have a modular design and changing a game is as simple and disconnecting the old game and connecting the new game. Talk with our team on compatibility options. The Arcooda 8 Player Metro Fish machine has advanced wiring suitable for all fish games on the market and comes complete with illuminated joysticks and buttons featuring LED technology. Sea freight (estimated arrival 35-45 days) and air cargo (7-14 days) is available for Arcooda’s fish machines.